The Arts Engine’s production of Rocketbaby was the second FringeKids! production of the day for Max (my 5 year old grandson). In between shows we were in the Palmerston Library reading stories, making this a brilliant venue for kids shows. Already excited from the first show, Max was all over the place. When we saw someone we knew through the window, I knew it was time to head outside. While we were out there suddenly a kid voice started yelling “Max! Max! Dad, Max is here!” It was Max’s best friend from his after school program. Much loud talking, laughing, and general kid high jinx ensued. Those were two very hyper, excited, distracted five year olds. Smart parents decreed that they couldn’t sit near each other during the show. Even so, I wondered if Max would be able to concentrate on the play. He was. Right from the start he was completely engaged. That says a lot about the show. Dylan (Scott Labonte) and Ruth (Erin Eldershaw) get a present from their grandparents that is half rocket ship and half baby doll – a rocketbaby. Dylan plays with it as a rocket ship in a ‘boy’ way and Ruth plays with it as a baby doll in a ‘girl’ way. They discover that it’s magical and it takes them on a journey to space on their seesaw (teeter-totter). They visit the moon, Mars, Saturn, and Jupiter. The seesaw is amazing. They do wonderful things with it. It spins around as well as going up and down. I would have loved to have one like that. While they were playing and eating cheese on the moon Max leaned over and asked his mum – Megan – how they could breathe on the moon (because clearly the rest of the story totally held up to scientific scrutiny) so he was clearly into the action. Kids are such great audiences; I love going to children’s shows. Eldershaw and Labonte were very believable kids, great body language. They moved and played like kids. Eldershaw does terrific baby sounds. For the first half of the show I was concerned because they were stuck in such stereotypical gender roles, Dylan did ‘boy’ stuff and Ruth did ‘girl’ stuff, but that changed in the second half, much to my relief. There were some Martian puppets that I loved but my favourite thing were the UFOs that they met. They were seriously funny. When Megan asked Max what he liked best about the show he said ‘the big eye’, one of the UFOs. Max has a younger brother who will be three in September. Megan asked Max if he thought Desmond would like it and Max said yes so even though the show is billed for four to nine year olds you’d be fine taking a younger child. KidsFringe! shows sell out on the weekend so if you’re thinking about going it’d be a good idea to get advance tickets or go during the week. You’ll enjoy Rocketbaby as much as your children will. It’s a delightful show. 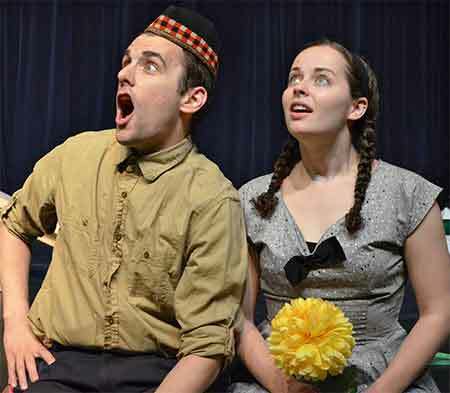 Tickets for FringeKids productions are $10 for adults, $5 for those 12 or younger. Tickets can be purchased at the door (cash-only), or can be purchased in advance for a $2 service charge either online, by phone (416-966-1062), or from the festival box office at the Fringe Club. (Rear of Honest Ed’s, 581 Bloor St. West). Money-saving value packs are also available if you are going to at least five shows; see website for details.